Christmas Pillows #1: Christmas & I Believe [C8897] - $12.00 : Yarn Tree, Your wholesale source for cross stitch supplies. Cross Stitch pattern from Mani di Donna. What cute pillows for Christmas! 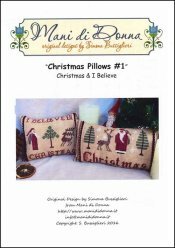 The first pillow design has, "I Believe In Christmas," stitched with Santa, a Christmas tree & reindeer. The second pillow design has "Christmas," stitched at the bottom with trees, a reindeer & Santa stitched above. Snow is falling in the background. Stitch count is not listed.